Your tooth is made up of three layers. The soft, inner part is called the pulp and is a living organ made up of blood vessels and nerves. 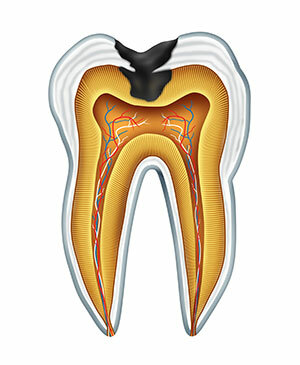 Surrounding the pulp is the dentin, which is a little bit harder. Moreover, finally, your tooth’s outer layer is the enamel, which is the strongest thing in your body, stronger than even your bones! However, as strong as enamel is, something extremely small can break through it: bacteria. The bacteria in your mouth are quite dangerous to your teeth and can lead to tooth decay and cavities. We here at Great Grins for KIDS - Portland want you to understand what causes cavities so we can help prevent them from forming before they even start! If you have ever had an ongoing toothache, pain or sensitivity to hot or cold foods and drinks, and experienced discomfort when you eat sweet foods, then there is a very good chance that you have suffered from a dental cavity. Also known as “tooth decay” or “dental caries,” cavities are a very common occurrence and can be caused by a wide variety of factors. Some of the more major triggers for cavities include genetics, lifestyle, and diet. Above all, though, the number one cause of cavities is bacteria! Your mouth is full of bacteria, both the good kind and the bad kind. For the most part, you can keep the bacteria at bay by taking good care of your teeth and mouth. If left to grow unchecked, though, these bacteria can start to wear away at your dental enamel. A fuzzy, sticky residue that clings to your teeth is where these bacteria are hiding out, and this residue is called “plaque.” The bacteria in the plaque are releasing acid, and if the plaque sits against your teeth for any duration of time, the acid will erode through your enamel. Once the bacteria eat into your teeth, you officially have a cavity. You can prevent cavities by avoiding too much sugar. Sticky candies and soft drinks are the worst for your teeth. Instead, reach for a diet full of fresh fruits and vegetables and dairy. You can protect your teeth with the vitamins and minerals found in a healthy diet. Also, make sure you brush your teeth twice a day using a soft-bristled toothbrush. Brush at a 45-degree angle for two minutes using toothpaste with fluoride in it. After you brush your teeth, you must floss at least once a day. Use an 18-inch piece of floss to clean your teeth, and use a fresh segment of floss for each tooth. Make sure you work the floss between each tooth and up under your gum line to remove all plaque and trapped food. You can also use an antibacterial mouthwash every night to help kill bacteria. Not all tooth decay is going to be painful, which is why routine dental checkups are so important. We advise that you schedule an appointment with us every six months for an exam and a cleaning. To schedule your appointment with us for your cleaning and checkup, give us here at Great Grins for KIDS - Portland a call at (971) 470-0054 today!